Welcome to our 1st edition of the Grab hosted Grab Talks session! Hear from 2 experts and understand about their experience in developing Grab Indonesia. they will share about Grab's Journey, the challenges, and share about how they as insiders also grow with Grab. Uun Ainurrofiq Leading cross expertise team of operation & growth, serving 222 cities across Indonesia. Passionate team mentor and story teller. Prior to Grab, he's been a nomadic professional working across SEA & UK. Firmed up inner calling to return home with a dream to catalyze nation growth through technology. He has an unique combination of education background in Bachelor degree in Technology and a Sweden Master of Science Degree in Entrepreneurship & Innovation Management. 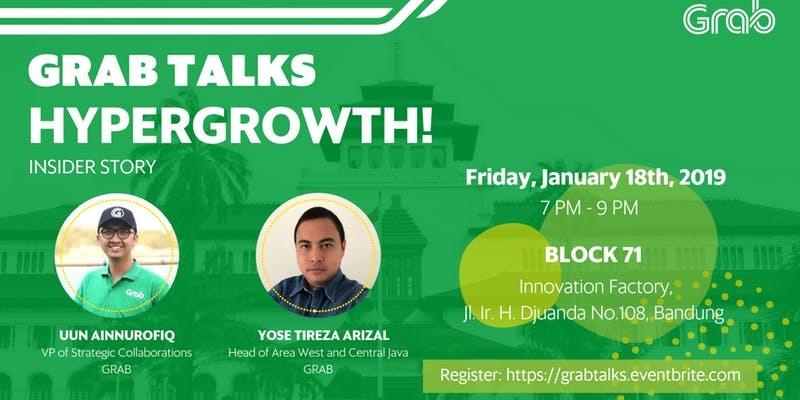 Grab Talks are a series for peers in Indonesia's startup community to share knowledge and best practices as well as provide an informal space to network. Originally conceived within Grab to focus on pushing the boundaries of technology and business to Drive Southeast Asia Forward, we are excited to now make available these sessions to the wider tech/startup community. Stay tuned and check back for our line-up of interesting speakers and content.